Fighting cancer is one of the most challenging things we can experience – but with OC CyberKnife, it’s never a battle you have to go through alone. As a leading cancer treatment center serving the greater Orange County and Los Angeles, CA areas, we’re proud to provide state-of-the-art cancer treatments like CyberKnife from our world-class cancer center. Our team of expert cancer doctors, radiation oncologists, and cancer care specialists work with patients individually to craft comprehensive treatment plans, helping our patients beat cancer with minimal impact on their lifestyles. We strive to be a complete resource to our patients, so if you or a loved one have been recently diagnosed with kidney cancer, you can refer to the frequently asked questions below for more information. While fighting kidney cancer can be a long and difficult battle, the cancer doctors at OC CyberKnife are dedicated to helping you beat cancer and reclaim whole-body health. Contact us today to learn more about how we can help you overcome kidney cancer and schedule a consultation to learn more about potential treatment options. Working together, we can help you overcome cancer and return to a healthy, normal lifestyle. Q. What exactly are the kidneys and what function do they serve? While most people have 2 kidneys, you can survive with just one. With modern medical treatments like dialysis, which uses a specialized machine to filter the blood and fill in for kidneys, you can even survive without functional kidneys or with no kidneys at all. Kidney cancer refers to any form of cancer that starts within the kidneys. Renal cell carcinoma (RCC) is the most common form of kidney cancer, accounting for about 90% of cases. The remaining 10% are made up of transitional cell carcinomas, Wilms tumors (only in children), and other more rare forms of kidney cancer. Q. Is there only one type of renal cell carcinoma (RCC)? Q. Who is most at risk for kidney cancer? While these factors increase the risk of kidney cancer, it’s impossible to say for certain who will and will not develop kidney cancer in their lifetime. Often, people develop kidney cancer even though they have no risk factors. Q. 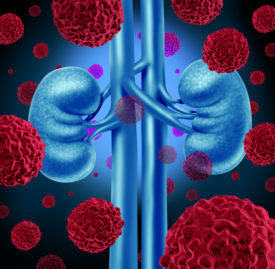 What are the symptoms of kidney cancer? Different symptoms may be present depending on the type and stage of the cancer, so a given kidney cancer may display any combination of these symptoms. Q. How do you diagnose kidney cancer? Physical & Medical History Exam: This is a rather routine screening where a health care provider will ask you about your medical history, your family’s history of kidney cancer or other conditions, and perform a physical exam. Urine Test: In this test, your doctor will collect a small amount of urine and test it for traces of blood, bacteria, certain proteins, or cancerous cells. Blood Tests: While a single blood test can’t diagnose kidney cancer, we can use a complete blood count (CBC) and blood chemistry test to detect certain signs and signals linked to kidney cancer. Medical Imaging Tests: Using tests like a CT scan, ultrasound, intravenous pyelogram (IVP), angiography, or a variety of others, we can use tests to get an image of your kidneys and detect any tumors. Biopsy: In this test, your doctor will remove a small sample of tissue from the tumor. A pathologist will then examine it under a microscope to determine what form of kidney cancer it is. Biopsies for kidney cancer are relatively rare, as a CT scan or MRI is usually sufficient to diagnose the cancer. Q. What treatment options are available for kidney cancer? Surgery: In conventional surgery, a surgeon may remove part of or your entire kidney. This is a standard treatment for kidney cancer that has yet to spread to other organs. Targeted Therapy: This treatment uses specific medicines to attack the cancer cells or target the blood supply to the tumor. This is most common for advanced kidney cancers. Biological Therapy: Using medicines that stimulate the immune system to fight the cancerous cells, we may use this treatment to prevent the tumor from spreading to other parts of the body. Chemotherapy: In this treatment, we use specific medicines and chemicals to try to kill the cancerous cells in the kidney and any others that have spread to other organs. Ablation Therapy: This form of treatment uses either energy waves or extreme cold to kill cancerous cells in the tumor. Radiation Therapy: Thanks to advances in modern medical technology, we can now use advanced radiation therapy systems like CyberKnife to attack cancerous cells at the source and eliminate the tumor without the need for surgery or other invasive treatments. While it’s not right for everyone, CyberKnife provides a convenient option that’s highly effective for certain patients. Q. Should I get a second opinion if I'm diagnosed with kidney cancer? Q. How do I get a second opinion? Ask Your Doctor: You can ask your primary care doctor to refer you to a specialist in kidney cancer who can give you a second opinion. This may be a surgeon, medical oncologist, radiation oncologist, or any other cancer doctor. Call the Cancer Information Service: You can call (800) 422-6237 (800-4-CANCER) for information on cancer centers, programs, and resources near you to help you get a second opinion. Call the Kidney Cancer Association: Call (800) 850-9132 to learn what qualified health care providers in your area can provide a second opinion on your cancer diagnosis. Contact OC CyberKnife: At OC CyberKnife, we regularly provide second opinions for patients with kidney cancer and many other forms of cancer. Call us at 714.962.7100 to find out more about how we can provide a second opinion on your cancer care. Q. If I have my kidney removed in surgery, will I be able to live normally with just one kidney? Thankfully, most people can live normally with just one kidney. While you’ll need to be careful to avoid anything that may harm your kidney and should always talk to your doctor if you’re starting a new medication, get a bladder infection, or experience anything else that may affect your remaining kidney, most patients with just one kidney live normally without long-term health problems. If your remaining kidney does become damaged, dialysis can help you live without any functioning kidneys. Q. How is kidney research enhancing kidney cancer treatments? Genetic Therapy: Genetics is the study of genes, which are biological “instructions” that tell each cell how to do its job. Several genes may play a role in causing kidney cells to become cancerous, and researchers are making more progress on understanding the role of genetics in kidney cancer every day. Biologic Therapy: New medicines for biologic therapy are being tested as you read this, and these new medications may pave the way for more effective treatments in the future. Chemotherapy: While chemotherapy isn’t always effective for targeting kidney cancer, new types of medicine are being tested through research that may help scientists understand why certain kidney cancer cells are resistant to cancer and help them design better treatments. Clinical trials are used to evaluate the efficacy of new kinds of medicines and cancer treatments. Medical researchers perform clinical trials to determine how effective a new medication or treatment may be, as well as determine what side effects it may cause. If you choose to participate in a clinical trial, you may gain access to new forms of medication before the FDA approves them. While this can help you access a better treatment for your cancer, it may also pose a greater risk. You should talk with your cancer doctor to see if any current clinical trials might present a good option for your treatment.